Description: Children who love to go on picnics will love this Fun With Food Picnic set! The set includes a large picnic basket with a hinged lid and carry handle, plus a picnic for two that stores inside the basket. Designed for children ages 3 to 7 years old. FPT7096 - Tan plastic picnic basket with a tan hinged lid (hinged in the middle), and a RED hinged carry handle. The handle is attached in the center to allow the handle to fold to the left or right. The sides of the basket are simulated to look like a real basket. All of the other #2109 accessories in this set fit inside of the basket. 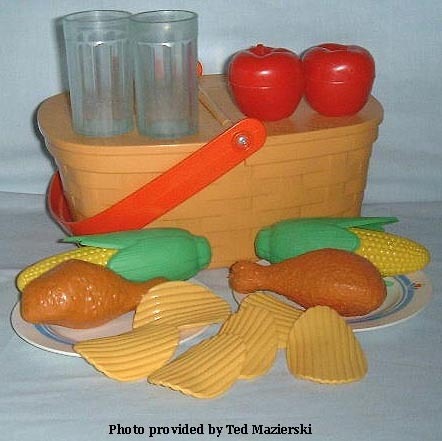 The basket lid is marked "Fisher-Price". 2 each - FPT7079 - Red plastic apple. 2 each - FPT7097 - Light brown fried chicken drumstick (leg). The drumstick is 2 halves molded together with a visable seam. The sides of the drumstick is textured with ripples to look like a real piece of fried chicken. Measures 4-1/4" long. 2 each - FPT7098 - Yellow ears of corn on the cob with molded corn on the sides. Two halves molded together with seam down the middle. Has a round knot on one end that fits within the hole on the inside bottom of the FPT7099 corn husk. Measures 4-3/4" long. 2 each - FPT7099 - Green corn husks that the FPT7098 ear of corn fits into. The husk is open on one end allowing the ear of corn to stick out, and the bottom of the husk has molded "leaves" on the sides. Measures 3-7/8" long. FPT7100 - White cloth potato chip bag with a blue background on the front, a picture of potato chips, and the words "Potatoe Chips" in red and white. Fisher-Price potato chips fit inside. 6 each - FPT7101 - Yellow ribbed potato chip. The chip is curved and shaped like a Pringles Potato Chip. 2 each - FPT7789 - Round white plate with no decorations nor imprint molds. The edges of the plate are slightly raised higher than the center of the plate. Back of plate is marked, "©1990 FISHER-PRICE, MADE IN USA". Measures 5-3/8" wide. 2 each - FPT7103 - Blue plastic drinking glass with a smooth rim around the top, and ribbed sides. FPT14371 - The picnic basket could also be black. FPT7104 - This set was sold in a 12" long, 13" high, 5-1/8" deep box. 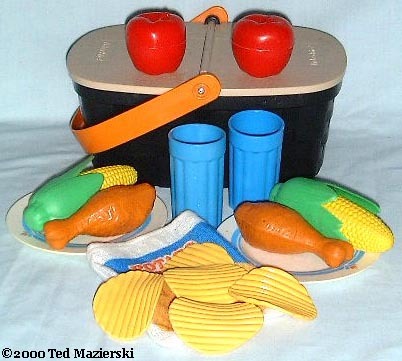 Also see 1995's #3303 Picnic Basket Super Set.